In 2013 we determined that, under certain circumstances, the 9C1 Pistols fitted with Fast Action Triggers could discharge when dropped. Consumer safety is our first priority. We will retrofit all affected 9C1 Pistols with Fast Action Triggers and all Fast Action Trigger kits at our factory at no charge to our customers. The retrofit will include removal of the affected Fast Action Trigger and installation of the new Elite Trigger 804. Old parts will not be returned. Do not load or fire your 9C1 pistol with the Fast Action Trigger until it has been factory retrofitted with these new parts, the pistol could DISCHARGE if dropped with a round in the chamber. Original Fast Action Trigger – Safety protrudes slightly. Needs Retrofit! 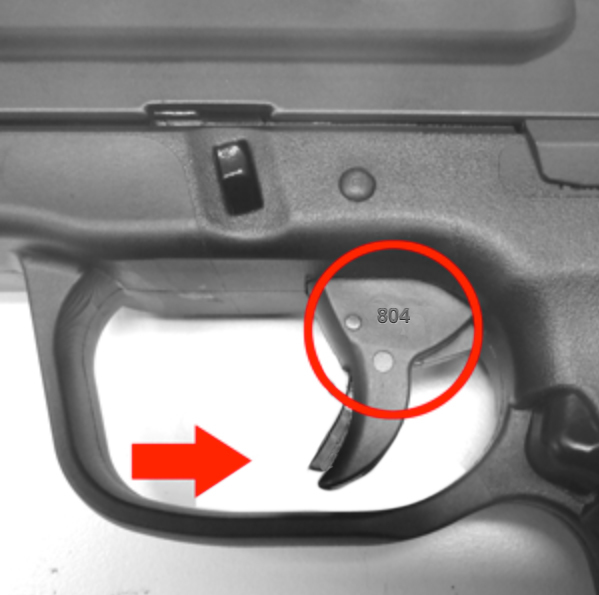 DAO Trigger can be identified by shorter trigger safety which does not break through the bottom of the trigger. DAO trigger rotates further forward. This Pistol does not need retrofit. If you own a Fast Action Trigger kit or 9C1 pistol with a Fast Action Trigger which does not bear the engraving “316” please contact us immediately to arrange for replacement of your Fast Action Trigger Assembly. If your 9C1 pistol has a Fast Action Trigger and it is engraved with “316” or you have a Double Action Trigger or Elite Trigger 804 it does not need to be retrofitted. We will ask for your Name, Address, Telephone Number, 9C1 Serial #, and provide to you an RMA # for tracking purposes.